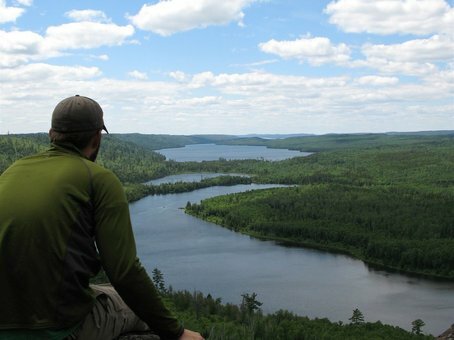 When you are ready to take a break from the canoe, there are many hiking trails to explore on the Gunflint Trail. Deep blue lakes, ethereal waterfalls, high cliffs, lush forests of pine, maple and birch, and other natural wonders await. 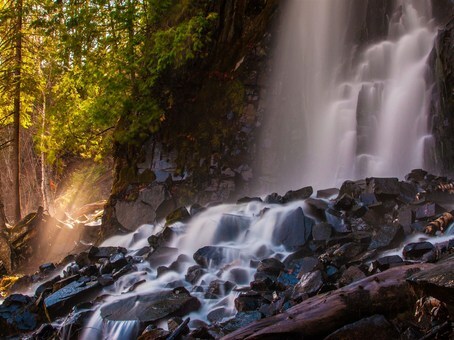 Read below to learn details about Honeymoon Bluff, Clearwater Palisades, Border Route Trail, Rose Waterfalls/Stairway Portage, Mountain Lake Watap Lake and Rove Lake, Johnson Falls, Bridal Veil Falls, Magnetic Rock Hiking Trail, Caribou Rock Trail Loop, and Daniels Spur Trail. About the hike: Two miles down the road from the lodge is a short but steep (90-steps) 0.6 mile round-trip hike to the top of a bluff that overlooks Hungry Jack Lake and West Bearskin Lake. This is an excellent spot to watch the sunset. 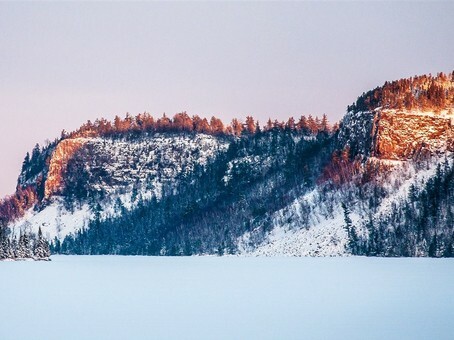 About the hike: After paddling across Clearwater Lake, you will find a trail that climbs almost 400 feet to the top of the first bluff that makes up the iconic palisades on Clearwater Lake. From here you will be able to look down and across at Clearwater lake and all the way into Canada. About the hike: Clearwater is the central entry point to the Border Route Trail (BRT). This hiking trail is 70 miles long and runs along the Canadian/US Border. It is an old footpath that was used by the original fur traders to move goods. From Clearwater Lake there are several places where you can access the BRT for shorter day hikes and great overlooks and wildlife. Wear sturdy shoes and be prepared for some rougher terrain! About the hike: If you want a fun 1/2 day of paddling and hiking, this isan ideal option for you. Portage Duncan Lake from West Bearskin then paddle this beautiful and intimate lake to the northern end. Then beach your canoe near a large beaver dam. From there you it’s a short distance to the spectacular 60 foot Rose Falls. 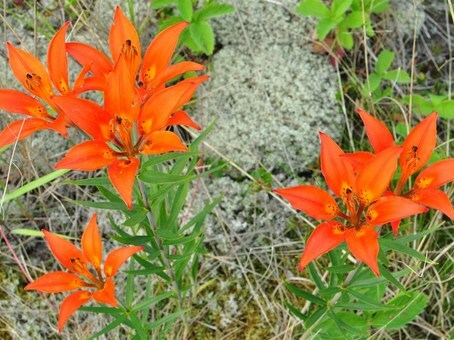 Explore and hike to three consecutively higher vistas looking into Canada. The Stairway Portage, which was built by the CCC boys during Franklin Roosevelt’s Presidency (1935), can be visited as well. This is a great experience. Plan for roughly five hours round trip. About the hike: Begin from our dock on Clearwater Lake and paddle 6 1/2 miles down this beautiful lake lined with high cliffs, great birch stands and bays. 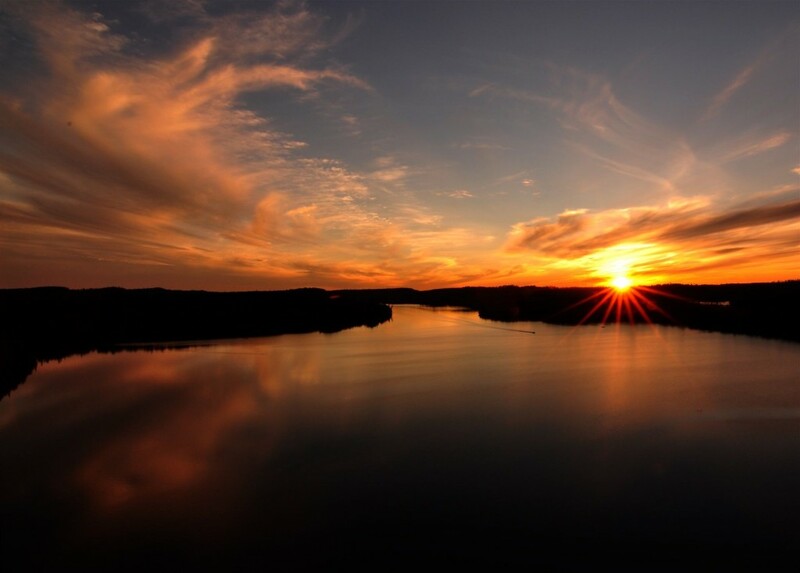 Take your empty canoe, trail lunch and fishing or camera gear and portage to Mountain Lake. From Mountain, you can to go Watap and Rove Lakes. 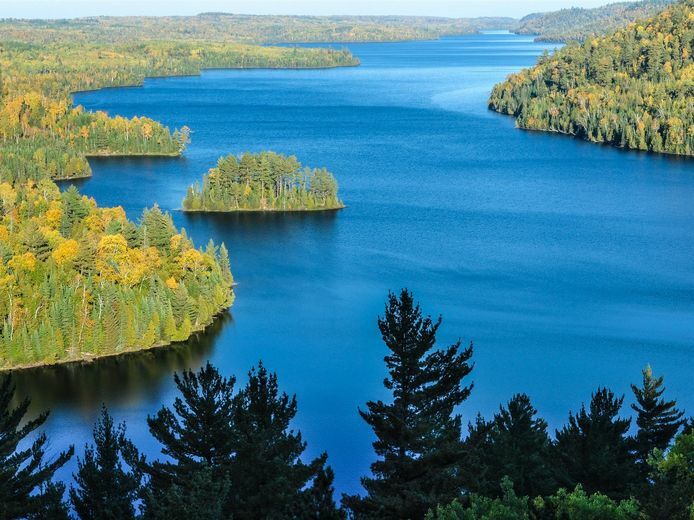 These are beautiful border lakes with Canada and are fun for smallmouth fishing and exploring. The Mountain Lake portage intersects with the Border Route Trail. This is a full day trip so start early. About the hike: Another paddle-and-hike option, this one has you paddle east on Clearwater Lake and take the Caribou Lake portage into Caribou (a very good Walleye lake, so bring your pole), little Caribou and Pine Lakes. Beach the canoe here and walk back twenty minutes through an old growth forest to a spectacular 3-tier waterfall, which even offers swimming in its bottom pool. This is a full-day trip so pack a lunch, and remember to bring your camera! About the hike: This 8-mile round trip hike combines the Crab Lake hiking trail and the Border Route Trail. 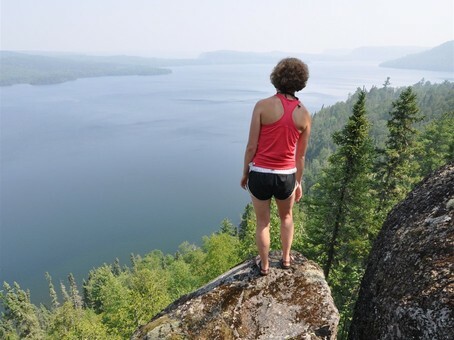 The majority of the trail passes through recently burned landscapes offering expansive views of Gunflint Lake and Canada. The sun can be a factor on this mostly open trail (remember your bottled water), but these seldom-visited, unique falls are truly worth the walk. About the hike: This is a 3-mile hike and includes hiking though some burned area from the Ham Lakefire. 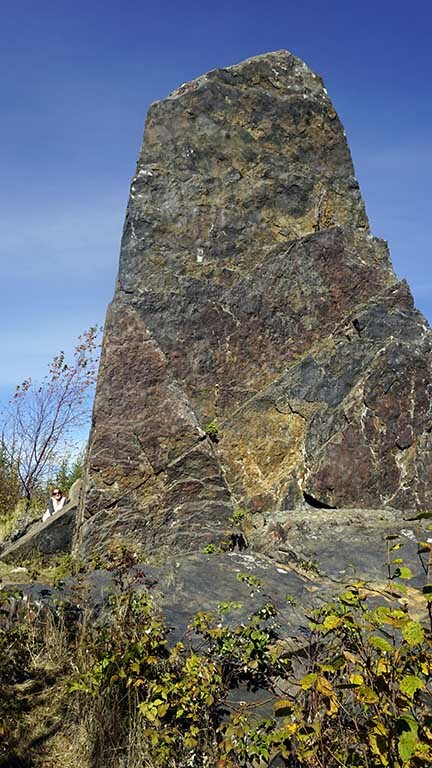 The destination is a 60-foot rock standing on end with strong magnetic attraction, a unique remnant of the glacial period. Bring your compass to test the magnetism. About the hike: Start at the Caribou Rock Trail Head, first hiking to the overlooks of West Bearskin Lake, then to Moss Lake, and then to Duncan Lake. 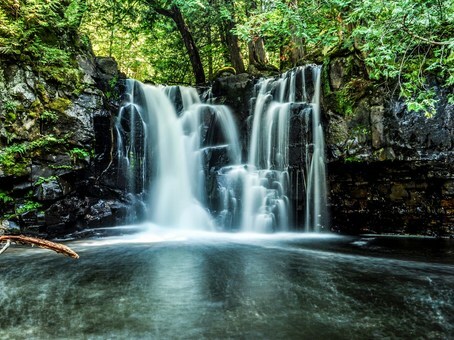 Explore Rose Falls and connect to the Border Route Trail (BRT), heading east along the BRT to find an old cedar grove. Connect with the Daniels Spur Trail and head south until you come out at the lodge. This is a full day hike so be prepared with a lunch. About the hike: This often wet trail leads to Daniels Lake. 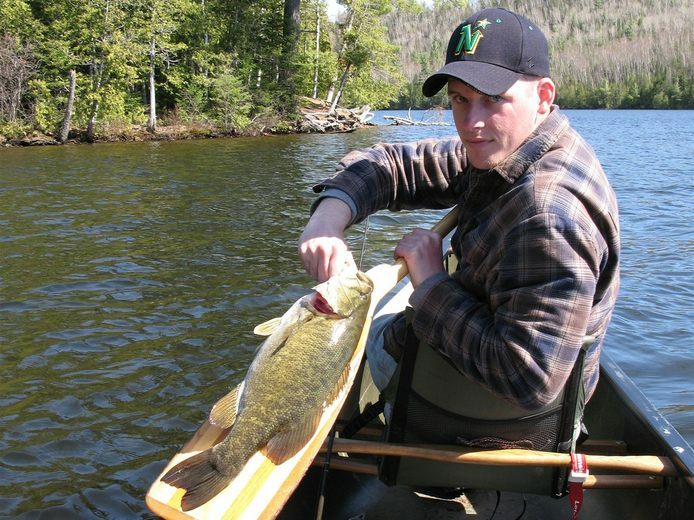 We keep a canoe at Jim Lake; you can check it out then portage it the short distance to Daniels to enjoy a very quiet and scenic lake full of Smallmouth Bass.